Launceston have appointed Neil Bayliss as the club's director of rugby on a permanent deal and revealed a new coaching team for the 2014-15 season. Bayliss was initially given the role on an interim basis after the club sacked Cliff Rainford as head coach in March. Michael Lewis and Pale Nonu have been appointed to assist Bayliss as forwards coach and backs coach respectively. 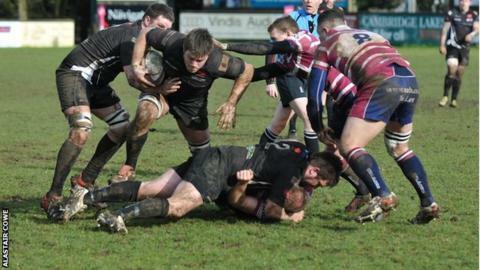 Launceston will be playing National Two South rugby again next season after they beat Shelford 16-6 on Saturday. Launceston won four and lost four of the eight games played since Neil Bayliss was appointed as the club's interim Director of Rugby. The result saw the club finish 12th in the division with 67 points from 30 games. Former captain Tom Rawlings, who had assisted Bayliss as forwards coach since March, recently left the club, unhappy at the process of appointing a new coaching team. Rawlings' replacement, Michael Lewis, predominantly a lock, made 64 appearances for Plymouth Albion before his playing career was cut short by a knee injury in 2010. He was the senior coach at Tavistock during the 2013-14 season. Former centre Nonu made 22 starts for Launceston, scoring three tries. The older brother of New Zealand All Blacks centre Ma'a Nonu, he joined Launceston in 2010 after playing for Mounts Bay and St Mary's College in Dublin. He later went on to play for Rotherham Titans and Plymouth Albion.